Compelling performances in an intelligent play that considers notions of choice and free will. She’s a quantum physicist. He’s a beekeeper. Constellations seems, at first, to be a typical boy meets girl story, with a twist alla Kate Atkinson’s Life after Life. Marianne (Lousie Brealey) and Roland (Joe Armstrong) meet at a barbecue and initially don’t really hit it off. The twist is that we’re shown successive versions of the event until they finally do get it right. Staying closely to this premise, we’re given story of their relationship/s. Its both richly funny and deeply heart-breaking. A very popular London opening in 2012 saw Nick Payne’s Constellations garner heaps of critical praise and, as part of their on-going commitment to produce national tours of their work, the Royal Court have the play doing the regional rounds. 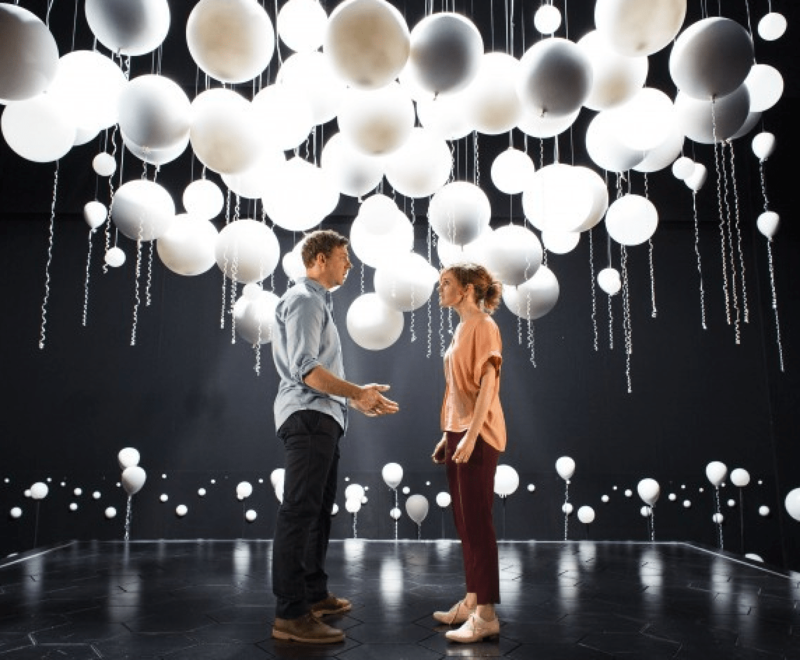 Directed by Michael Longhurst, Constellations expands upon Marianne’s multiverse theory to explore the endless possible outcomes of our choices. For Marianne, free will might be a fallacy – for, if every possible version of her life exists in parallel universes, then surely, in this particular life, she doesn’t really have any choices. It’s a philosophical question that left me thinking long after I left the Old Vic and it’s this notion of choice, freedom and control that Payne is really tackling. Its left ambiguous as to whether Roland and Marianne are really in charge of their fate, but the various futures that each decision/non-decision might lead to are teased as the play progresses. In several worlds, she cheats and in another, it’s him. They fall apart and sometimes, they come back together. It’s a credit to all that the narrative never becomes confusing or boring, even as whole chunks of dialogue are repeated. Each time, Brealey and Armstrong find new and different nuances – sometimes he’s really blokey, sometimes she’s a bit weird – and its almost like being in a rehearsal room, with the actors trying something fresh in each run. Its just that here it’s as if Marianne and Roland are rehearsing their lives. Constellations moves (almost) chronologically, offering a variety of outcomes before moving forward with one. Even though each scene is necessarily short, there’s a cumulative emotional impact in their grouping which climaxes in a deeply moving set of exchanges in a hotel room. Marianne and Roland are abroad, the evening before she intends to take her own life at a dignitas-esque clinic, taking control of her fate when the universe has seemingly conspired to rob her of any choice. The layering and repetition of the scene packs a truly powerful emotional punch and I’d imagine there were a few damp eyes in the Old Vic to match mine by the time the play was over. Running at around 80 minutes, Brealey and Armstrong are both on stage for the entire play and yet we never long for a shift of pace or staging. It’s all very simple, but they are utterly captivating. The shift into a parallel life is indicated clearly – the stage is full of entrancing white orbs, lit beautifully, that flash when the scene switches. Evoking the vastness of the universes that Marianne studies, these orbs fill the space and are the only companions that the actors need. Constellations is great, with fine acting and interesting, intelligent writing. Somewhere, in this universe, or another, you should really make the choice to see it. The national tour of Constellations will continue until 4th July. It will visit Southampton, Manchester, Cambridge, Richmond and Brighton. More information can be found on the Royal Court website.